In a previous post I discussed the concept of starting out with a character with issues and how the plot action affects the character, creating the character arc. Today’s post will explore how to create both the weaknesses and the relevant plot points to bring the character to a new set of values, behaviors and attitudes. It draws on John Truby’s techniques in The Anatomy of Story. You want your characters to change over the course of the story. To do that, they must have problems that get solved through the plot, so they emerge better people at the end. But more than problems, characters must have weaknesses. 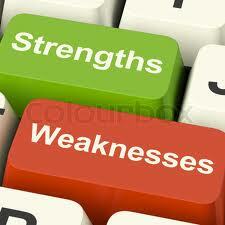 These weaknesses define them, their actions and attitudes towards other characters. Selecting the right set of weaknesses is vital to setting up the plot and character arc. How does the hero overcome his problems? 1. Psychological weakness. This is some issue or behavior that might not seem like a problem, but over the course of the story is exposed as a problem. In my novel Crush (which I’ve used as an example in other posts) the main character Simon doesn’t go for relationships. He prefers casual hookups. He wants to be rich and he focuses most of his energy on work so he can succeed and eventually get rich. He’s perfectly happy with his life and his goals. Enter plot… in the form of a love interest. Once he meets Austin (it’s a gay romance…) Simon realizes what he thought were fine values and behaviors mean might not be as he discovers he wants something else out of life. He realizes to succeed in his job he has to learn to cheat people. He has to rethink his personal goals and values. The psychological weakness is something that hurts the hero. Selfishness, fear of something, attitude toward something. It doesn’t feel like a weakness to him until the plot action makes him realize it. 2. Moral weakness. This takes things to a new level. A moral weakness is something that hurts others, and it a romance, a weakness that hurts the love interest. Take Simon again. He doesn’t want relationships. That’s a psychological weakness until it affects Austin. Now it’s a moral weakness. Simon’s stance on relationships hurts Austin, who would like to have a relationship with Simon. Until Simon can resolve his attitude about relationships, spending time with Austin does both more harm than good. How do you find a moral weakness for your hero? It might be organic to the story you want to tell, and the change you want to create for your character. How will he become a better person in how he treats others (specifically the love interest if you’re writing romance)? The starting point will be your moral weakness. Look at the psychological weaknesses and find an immoral action that stems from them. What moral weakness does that imply for the character? Another way is to take one of the hero’s strengths and warp it into a weakness. A firefighter who is brave sounds like a hero. But if it leads him to take risks that put his crew in danger, it is a moral weakness. A cop or lawyer who blurs the edges of the law to get the bad guys are two more examples. Take one of his virtues, and create a weakness that is completely the opposite. A hero who is scrupulously honest is hiding a terrible secret and it’s hurting someone else until he owns up to the truth. Once you have your character’s weaknesses defined (the starting point), write down what corresponding value he will hold at the end of the story. How will each weakness be overcome or resolved so we go from the set of starting issues to the final values? That will give you plenty of ideas for the heart of the story. A. Simon wants to be rich.—-> B. Simon realizes there are more important things than money. How does Simon go from A to B? He realizes that to succeed in his job (and obtain wealth) he has to do things which hurt other people and might even be illegal. At first he brushes off the impact that has on him, but when Austin’s family winery becomes the target, Simon finally realizes how much damage he is doing. He reevaluates both his goals and his behavior. When you’re writing romance, you will have two key characters. Should you do this process for both? That depends, mainly on the length of the piece. In a novel, you can explore both characters’ weaknesses, but in anything shorter, focus on the arc of just one character. Even in a novel, if you focus more on one character’s journey you can do a better job of completing it satisfyingly, without rushing, skimping or dragging out the story too far past one character’s resolution. If both characters clash and resolve their weaknesses in the same plot arc, then it might work. You don’t need to give both main characters an equal number of scenes or treatment, even in a romance. Sometimes there’s more drama and conflict when readers see (and identify with) more of one character’s story. Just be sure to choose the character who has the bigger weaknesses and travels the farthest in the story, the one who has lower lows. Readers will be drawn in by his dilemmas and the painful choices he has to make. Your turn. If you’re working on a new story, play around with these concepts as you’re building your characters. If you’re already writing, take a break and examine the character arcs you’ve planned and see if adding in some of these elements will create more interesting characters. Good techniques for rounding out characters and giving them convincing relationships with other characters.